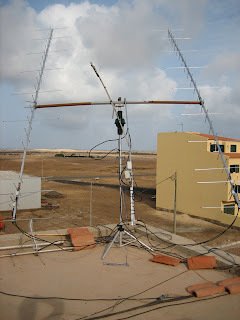 Many thanks to FRANK, DL8YHR and NORBERT, DL8LAQ for set up an EME 2m station on CAPE VERDE island (HK86NO). Frank and Norbert give to mny hams a new one on 2m EME with their 2 yagies. My new one 2m EME was made at 03-08-2007 in JT65b.Mny tnx . do you know planet ham?? Planet Ham is a website designed to aggregate blogs produced by Amateur Radio enthusiasts. The aim is to provide a central directory of Amateur Radio blogs so that interested browsers can visit subscribers sites and read about the various aspects of the hobby in detail.